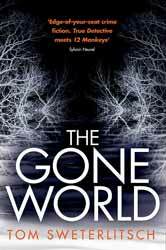 The Gone World (2018. 388 pages) is a science fiction novel by Tom Sweterlitsch. If you have read his previous novel, Tomorrow and Tomorrow, you’ll know that Sweterlitsch has a singularly dark vision of the future. The premise of the book is that prior to 1997 America has obtained technology which allows them to travel not only great distance into deep space but also into possible futures, following on the many universe theory. The opening of the book pretty much tells you all you need to know about the tone of the novel. Moss finds herself lost and alone on a failing mission, in a far future Earth. Caught in an endless forest of burned and ashen trees, upon one of which, she witnesses her own bloody inverted crucifixion. What follows is part hard science fiction, part crime fiction, part existential shock and part body horror. This is not a book for the faint of heart or the delicate of stomach. The only survivor of the Mursult massager is their young daughter, Marian. Moss travels to various iterations of the future to see if she can find clues to Marian's disappearance, hoping to save her from death. One of the things I really liked about the book was its setting. By placing Moss’s original time in 1997 and the future in 2014, Sweterlitsch can present our own future in a way that attests that, from a certain perspective, we are now living in the future which science fiction once promised. The book also contains another central mystery, Terminus. In the early days of time travel strange and forbidding future Earths had been visited, but now an apocalyptic second sun has appeared in the sky, heralding the end of humanity. As Moss travels to investigate, this event is moving closer and closer to her own time. From Moss’s perspective every time she jumps forward in time she does so to a different probable future, pocket universes which blink out of existence when she jumps back. Some are inhabited by organisations which are aware of travellers, intent on capturing them alive to save their version of the future, if only for a brief time. This is very smart science fiction, the sort of which you don’t often come across. The book is full to bursting with inventive ideas married to some Hellraiser moments of graphic horror. What could have ended up as an intellectual mess instead provides a compulsive read.